The South African sugar industry is one of the world's leading cost competitive producers of high quality sugar. The industry makes an important contribution to the national economy, given its agricultural and industrial investments, foreign exchange earnings, linkages with major suppliers, support industries and customers. It also makes an important contribution to employment, particularly in rural areas, and to sustainable development. The South African sugar industry generates an annual estimated average direct income of R8 billion. The industry is diverse, combining the agricultural activities of sugarcane cultivation with the manufacture of raw and refined sugar, syrups, specialised sugars and a range of by-products. The approximately 29 130 registered sugarcane growers annually produce on average 19.9 million tons of sugarcane from 14 mill supply areas, extending from Northern Pondoland in the Eastern Cape to the Mpumalanga Lowveld. Sugarcane is grown predominantly in KwaZulu-Natal. Direct employment within the sugar industry is approximately 77 000 jobs, which represents a significant percentage of the total agricultural workforce in South Africa. Indirect employment is estimated at 350 000. There are approximately 1 550 large-scale growers (inclusive of 378 black emerging farmers) who produce 84.69% of total sugarcane production. Milling companies with their own sugar estates produce 6.72% of the crop. With the growth of economic development and empowerment of previously disadvantaged people, the participation of black farmers in sugarcane production is constantly increasing. More than 27 580 are small-scale growers, of whom 13 871 delivered cane last season, producing 8,59% of the total crop. 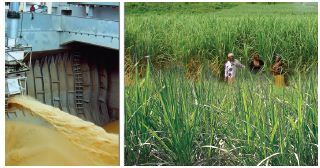 Sugar is manufactured by six milling companies with 14 sugar mills operating in these cane growing regions. The industry produces an estimated average of 2,2 million tons of sugar per season. About 60% of this sugar is marketed in the Southern African Customs Union (SACU). The remainder is exported to markets including those in Africa, Asia and the Middle East. The milling sector of the industry employs upwards of 7 000 people. Illovo Sugar Ltd and Tongaat Hulett Sugar Ltd own four mills each while Tsb Sugar RSA Ltd owns three mills. Gledhow Sugar Company (Pty) Ltd, UCL Company Ltd and Umfolozi Sugar Mill (Pty) Ltd own one mill each. Two of the mills owned by Tsb Sugar RSA Ltd are located in the Mpumalanga while the remainder of the mills are located in KwaZulu-Natal. The sugar industry's focus on producing a high quality, profitable and cost effective product is complemented by its focus on sustainable development which includes land reform, education and training, social investment, and the promotion of sustainable practices. The South African Cane Growers' Association and the sugar milling companies undertake development projects and are involved in Broad-Based Black Economic Empowerment through a range of important initiatives. The South African Sugar Association (SASA) provides a range of specialist services that enhance the profitability, global competitiveness and sustainability of the South African sugar industry. Administrating and facilitating adherence to the Sugar Act, the Sugar Industry Agreement and the SASA Constitution, is the responsibility of SASA's Industry Affairs Division. Provides a specialist service under contract to individual Mill Group Boards to determine the quality of individual grower cane deliveries to the mill for cane payment purposes. This analytical chemistry service assesses the recoverable value content in cane delivered to the mill by growers, providing a neutral and objective basis on which to calculate recoverable value payment by miller to grower. Responsible for managing industry matters that affect the national market for sugar including: statistically analysing sugar sales, supplies and demand, researching drivers of sugar demand, administering aspects of SACU/SADC sugar agreements, the administration of industrial rebates and generic marketing. The marketing, sales and logistics related to South Africa's bulk raw sugar is performed by the International Marketing division which focuses on achieving maximum net proceeds at an acceptable level of risk. The raw sugar is sold to refineries in the Far East, Middle East and the United States, either directly or through international trade houses. Performs in a range of areas that require specialist external communication skills, with a focus on international and regional trade issues, publications, communications, environment, development and nutrition. The Division administers the Sugar Industry Trust Fund for Education. The Institute is world-renowned for its research into the development of new sugarcane varieties, improved crop management and farming systems that enhance profitability. Effective delivery of new knowledge and technology make a significant contribution to the sustainability of the industry. The Shukela Training Centre is the preferred provider of agricultural and engineering training to the sugar industry. The Agricultural Training department focuses on the sugar industry and provides skills based training to all sugarcane farmers while the engineering training is carried out at the Centre. SASA's Finance division provides management accounting, financial accounting, taxation, corporate governance, treasury, payroll, procurement, information systems, and facilities management. SASA's performance and service levels are highly reliant upon the performance and service of its employees. The diversity of the skills SASA employs, ranging from high-level specialists to unionised industrial and agricultural labour. The wide geographical spread of operations, makes the effective management of people, their knowledge and their performance particularly important. In support of this need, the Human Resources division provides a comprehensive range of services to managers and employees in SASA, all of which aim to resource the organisation with highly competent and effective people who are committed to serving the best interests of the South African sugar industry. formed in 1910 to become SASA. industries in South Africa and in SADC.